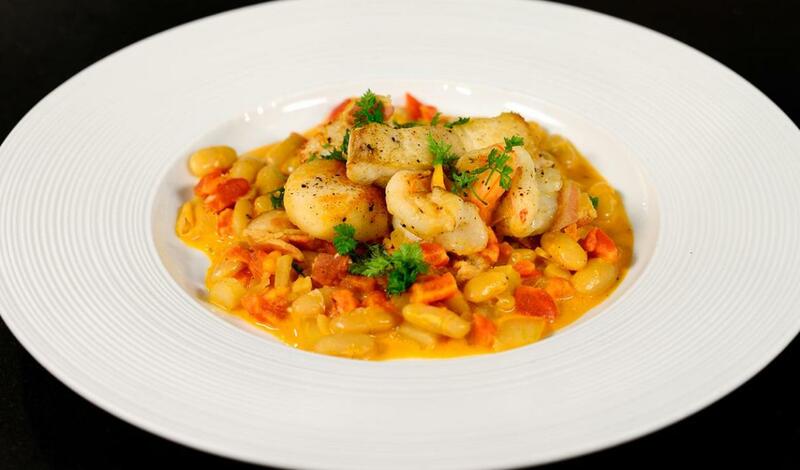 A new take on the traditional, slow-cooked French white bean casserole features fish fillet, shrimp and scallops—plus rich and flavorful Knorr Ultimate® Lobster Base. Season seafood with small amount of salt and sugar, and let cure 30 minutes in the refrigerator. Rinse, and pat dry with a paper towel. Season if desired with additional salt and pepper to taste. Heat ½ of the olive oil in a sauté pan. Add the fish, shrimp and scallops to the pan and cook until all are cooked through and browned. Remove and set aside for service. In the same pan, add the remaining oil and heat. Add the bacon, onions and fennel, and sauté until the vegetables are soft, about 5 minutes. Deglaze the pan with the white wine, and reduce by 2/3. Add the tomato paste, cooked beans, and tomatoes. Add the prepared Knorr Ultimate® Lobster Base. Allow to cook down for 5 minutes, until a stew-like consistency is reached. Add cream, and adjust seasoning. Add seafood back to pan and fold into stew. Plate with garnish of chervil.